Lane Bajardi, the intimate and snug political confidante to Beth Mason over years used a ghastly epithet, the "c" word in another email against another Hoboken woman. Bajardi never met or spoke to the woman, a Hoboken mom, but he apparently viewed her as a threat to Beth Mason's political agenda. That woman, Nancy Pincus would later become a fixation and an obsessive political target of Bajardi for years. In turn, the Hoboken mom would later host the widely read satirical Hoboken political blog Grafix Avenger. Lane Bajardi and his wife, Kimberly Cardinal Bajardi would file a $2,000,000 defamation lawsuit against Grafix Avenger, this MSV editor along with about a dozen other Hoboken residents in 2012. Lane Bajardi's apparent belief Pincus made online comments unfavorable to Beth Mason would lead to an out of the blue vicious attack email to Mason's Weehawken based political operative James Barracato. In a 2011 email the following year, Bajardi would use the same "c" word against another Hoboken woman to Hoboken411's Perry Klaussen, who promptly repeated it himself. 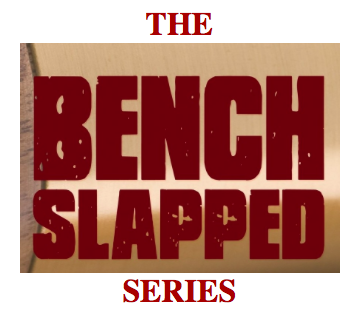 The Hoboken woman popularly now known as Grafix Avenger, is someone Lane Bajardi would viciously assail although again, he'd never met or spoken to her. His belief she was writing online comments on local websites favorable to the Hoboken reform movement and not supportive of Beth Mason was apparently sufficient. Grafix Avenger like another Hoboken woman who would later be described in a similar misogynistic assault, held no public job in Hoboken nor sworn elected office of any kind. She did hold however hold a one three year term on the Hoboken Zoning Board and that seat became the objective of years long political attacks. GA as she's sometimes called would start the satirical website called Grafix Avenger later the same month. 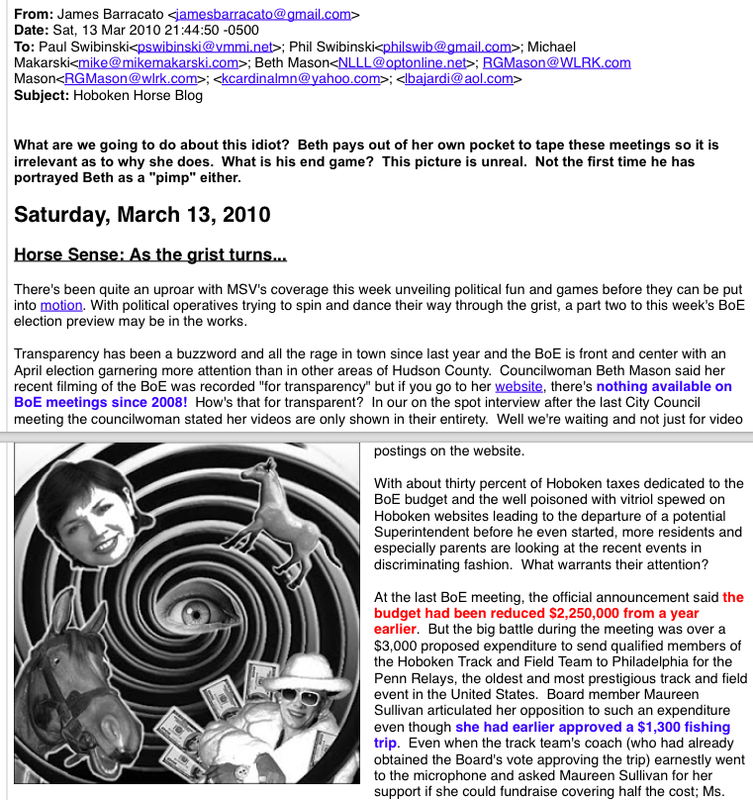 The following is an original and correct email between James Barracato of Weehawken with Beth Mason, Richard Mason at his work address for Wachtell, Lipton, Rosen and Katz, Hudson County media maven Paul Swibinski, Phil Swibinski, civil litigant Kimberly Cardinal Bajardi and her husband Lane "I'm not a political operative" Bajardi. Less than an hour later, James Barracato bypasses the Lane Bajardi thesis on screen names and inquires writing "Who is Hudson Shrimp?" The reference is likely to a comment on the NJ.com Hoboken forum. Bajardi responds to the inquiry saying he's unsure but "this people are all twisted liars." The person thought to be Tony is well known former councilman Tony Soares who is a dwarf. Barracato is believed by many to have penned a little read website called HudsonShark.com. In statements under oath however, Lane Bajardi claimed not to know who was writing under the screen name Hudson Shark. Separately, Lane Bajardi would testify under oath at trial last month saying he also did not know what James Barracato did for work other than own a small dive bar in Weehawken. MSV exclusively revealed earlier Councilwoman Beth Mason's financial disclosure forms declared a financial interest in a company of the same name: Cooper Place. Mason testified last month James Barracato is a "business partner." Defendants in the Bajardi v Pincus litigation obtained at least four figures of emails between Lane Bajardi and James Barracato. Hundreds of wireless communication records between Barracato and the Bajardis were also obtained in discovery but additional records between the parties including court ordered land line records were withheld from defendants. Almost all of the obtained communications between James Barracato and Kimberly Cardinal Bajardi and fellow civil ligitgant Lane Bajardi focused on Hoboken politics and political operations on behalf of Councilwoman Beth Mason. Lane Bajardi with his wife Kimberly Cardinal Bajardi in late July 2012 filed a civil lawsuit against a dozen or so Hoboken residents alleging defamation and demanding $2,000,000 from each. Some were accused of saying the Bajardis were political operatives working for Beth Mason. Last month Hudson Superior Court threw out Lane Bajardi's civil lawsuit mid-trial saying his case failed to show any damages or evidence proving his allegations. He claimed his job as a newsreader at 1010 WINS was harmed and could be damaged but the court ruled he presented no evidence whatsoever to support his claim. The graphic in the original MSV story above was credited to Grafix Avenger and may have been the trigger for Lane Bajardi's vitriolic email. Talking Ed Note: Wednesday is another Hoboken City Council meeting. At the previous meeting two Hoboken residents gingerly offered polite questions to Beth Mason receiving no answers. Are Hoboken residents expected to attempt obtaining public transparency out of Beth Mason after more than a dozen residents were sued for more than two and half years for daring to voice opposition to Old Guard corruption and Beth Mason? Unlike Hoboken elected officials, residents pay for their attorney fees out of their own pockets. Who carries the mantle for Hoboken residents?